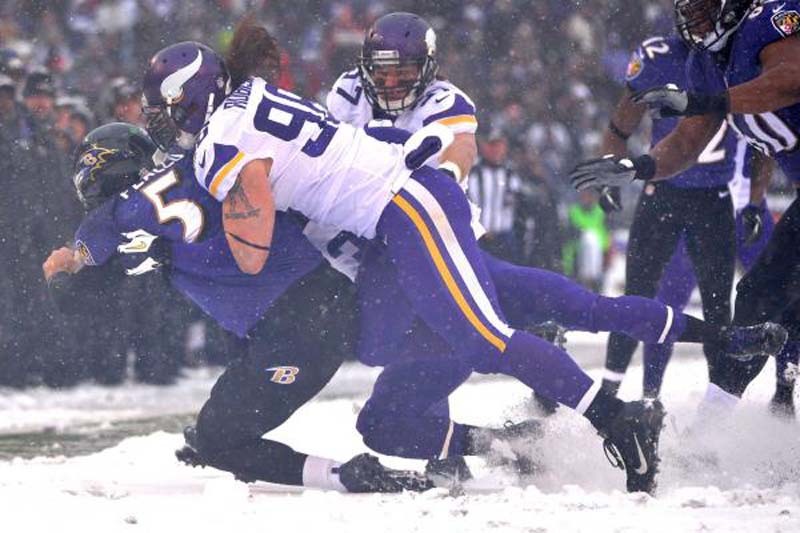 Minnesota Vikings veteran defensive end Brian Robison was close to walking away from the game last month. Now, after taking a pay cut for the second straight year, Robison acknowledged he is fairly certain the 2018 season will be his 12th and final one in the NFL. "More than likely, I think it is," Robison told the Pioneer Press on Tuesday during organized team activities. "I've talked to my wife and family about it and the body's just getting to that point. "I'm not going to make that decision wholeheartedly until probably the season starts, but I would say more than likely it probably will be [his final season]. ... If you ask me that in August, I'll have a definite answer." The 35-year-old Robison told the newspaper he was mulling retirement last month, terming it a 50-50 decision. After losing his starting job last season, he agreed to a pay cut from $3.5 million to $1.015 million in May. "I've been around this business long enough to have kind of learned the business because I wanted to, and I kind of knew [a pay cut] was coming. I didn't think it'd be that much, but I definitely saw it coming," said Robison. "Me and [Vikings general manager] Rick Spielman actually had a conversation about it, and I think for me it was just making the right decision for me and my family." Robison also agreed to restructure his contract in April 2017, having his salary slashed from $5.6 million to $4 million in exchange for a boost to his 2018 salary. He gave up the increase to continue playing. "I've given a lot of sacrifices on my part to stay here. At the end of the day, the Vikings have been willing to keep me here," said Robison. "I try to handle everything with class. At the end of the day, it's more important for me to be seen as a good person more than just a good player or a good athlete, so I want to try to handle everything in a way that the younger generation can look toward me and see me as a good man, not only as a good football player." Robison has spent his entire career with Minnesota, starting all but one game during a six-year span from 2011-16. He registered 42.5 of his 60 career sacks during that span. Last season, Robison appeared in 15 games, making one start, and had four sacks, 28 tackles and three forced fumbles in part-time duty. "When I came in here [in 2014], I didn't know much about him, but the thing that he's done really well is bought into what we're trying to preach from a team defense, a team aspect of things," said Vikings head coach Mike Zimmer. "He's been a good leader. He's not always afraid to voice an opinion on the things we're trying to get done, and I think it's great to have him here."